Next, click the “Run Old Installer” button. Once the setup starts, stop and read the next steps all the way to the end! 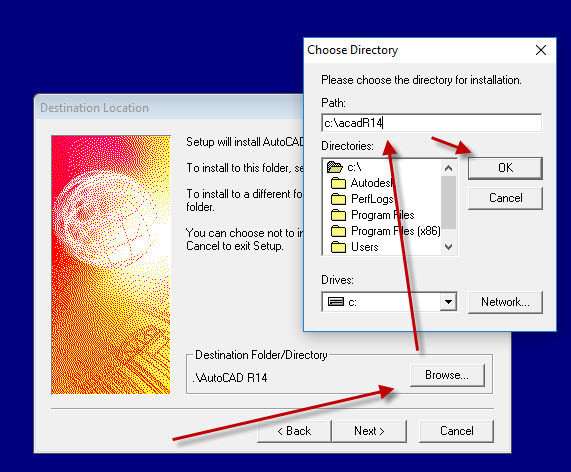 If your AutoCAD R14 setup does not start after 45 minutes, read the Troubleshooting section below. Ignore any errors related to not being able to create the shortcut e.g. “Cannot Create folder ‘AutoCAD R14’“, you will have to create a shortcut on your computer Desktop to your c:\acadR14\acad.exe by hand. Next click the “Fix Old Program” button. First try turning off UAC, rebooting, then restart the steps above. 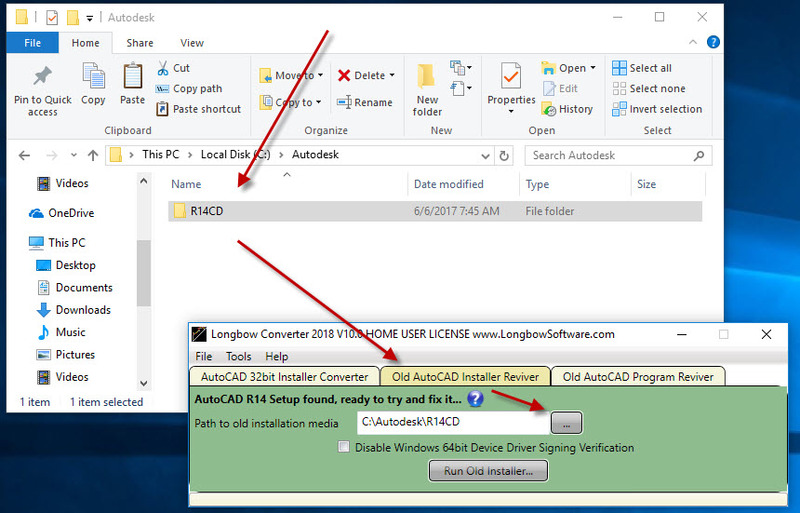 If you are getting either a Bad Mem Pointer error and or a Smartheap handler recursively re-entered error when you start your AutoCAD R14 then you need to re-run all the steps above, taking care to do each step precisely as it says, most likely you are missing from step 5 or you have not installed to c:\acadR14 as stated in step (7) above. This entry was posted in AutoCAD 14 (R14), Browse AutoCAD and tagged 32bit, 64bit, AutoCAD R14, Cannot Create folder 'AutoCAD R14', check with the software publsiher, Fatal error, FATAL ERROR: Heap Error, Heap Error, Install, Installing R14 Windows 7, This app can't run on your PC, This app cannot run on your PC, This program has compatibility issues, to find a wversion for your PC, Windows 7, Windows 8, Windows 8.1. Bookmark the permalink. Purchased and downloaded the Converter software to use for AutoCAD R14 and it works without a hitch on new Dell laptop running Windows 8.1. Also it is much faster and more responsive. 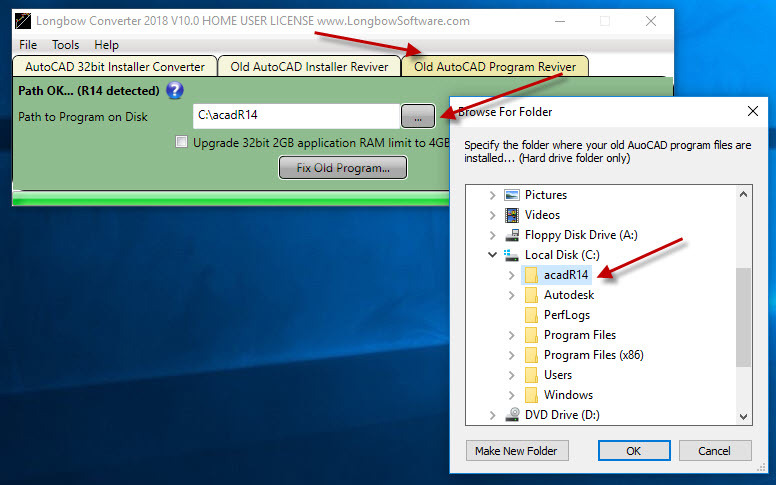 Using your Converter, I was able to install AcadR14 on my Windows 7 (32-bit) PC, apparently without problems, following the instructions from you: http://www/longbowsoftware.com/Help.php and https://blog.longbowsoftware.com/installing-autocad-r14-on-windows-7-and-windows-8/ . From the remarks in your blog site, I should have expected to wait up to 45 minutes before the Setup.exe should appear; however on my end, I didn’t have to wait at all. Setup.exe appeared after a few minutes, I ran it and AutoCAD was installed on my Windows 7 PC and seemingly works. The only glitz I experience now is when trying to running Render (a .ARX extension file), I get an error, “_render Unknown command “RENDER” Press F1 for help”. After installing the WinHlp32.exe for Windows 7 from MS so I open the AcadR14 Help menu, I found that “Help” doesn’t offer useful insight. The same installation of AcadR14 on my laptop (running XP Pro) works perfectly and Render runs. I am guessing that when I installed the Converter, I might have skipped a step, which might explain why the installation was so quick. Should I re-install the Converter carefully or is there a problem with .ARX files? Yes, make sure you have the latest Converter App, then uninstall and reinstall – it should work just fine for Render. Help is discontinued by Microsoft on Windows 10. Only Windows 7 and Windows 8 (and 8.1) support the old WinHlp32 framework. Where? I don’t see a link to that download. Hi, Loading onto Windows 10, once the installer runs (Step 6) it prompts x2 blank error messages, OK these to carry on, the third error message is causing a process abort. after OK to this error message the installer aborts the process, removes what was written to C:\acadR14 so the Old Program Reviver has nothing to work with.